Jericho archaeology is a topic which remains in perpetual controversy. However, the actual artifacts found from this area cannot be disputed. Excavations have produced ancient artifacts from the area, proving it is one of the world's oldest known cities. This section will briefly summarize the excavations and dates presented by archaeologists widely considered to be the top experts in the field of Jericho archaeology. Take a look at what others are saying about Jericho! From 1920-1926 he was the Director of the Department of Antiquities in Palestine, and during this time he walked the exact itinerary of Joshua's army. He began work on Jericho in the 1930's. Garstang and his team examined over 100,000 potsherd shards from Jericho. From these he dated the destruction of Jericho to be in the middle of the Late Bronze Age. Conventional dating places this time period from 1400-1300 B.C. This was at odds with the commonly held date of the Exodus and conquest at that time, which placed it during the 19th Dynasty of Egypt, around 200 years later. This would prove to be just one example of many conflicting dates surrounding Jericho archaeology. The Biblical account places the Exodus and conquest 480 years before the founding of Solomon's Temple. The 19th Dynasty chronology is in direct conflict with this, as 480 years before Solomon's Temple places the Exodus and conquest around 1450 B.C. At the time of Garstang's findings, scholars and historians put forth any explanation they could find to discredit his date. Skeptics thought Jericho archaeology was too questionable in nature to actually prove the Biblical account. Some claimed his classification of the pottery was inaccurate. Others claimed that not all of the children of Israel had gone into captivity. Among his findings were scarabs which bore symbols and pictures of Egyptian Kings. The latest of these Kings was Amenhotep II,dating from 1413-1373 B.C. There was no evidence found of any burials after this date. Garstang described the occupation of Jericho. "Four main epochs in its occupation are attested by that number of separate and successive periods of fortification...The walls were Babylonian in style...This period of occupation is to be assigned to the last centuries of the third millenium BC, say 2300-2000 BC and corresponds therefore with the first Semitic Dynasty of Babylon, the remote age of Hammurabi and Abraham ." Garstang goes on to state that about 2000 B.C.E. 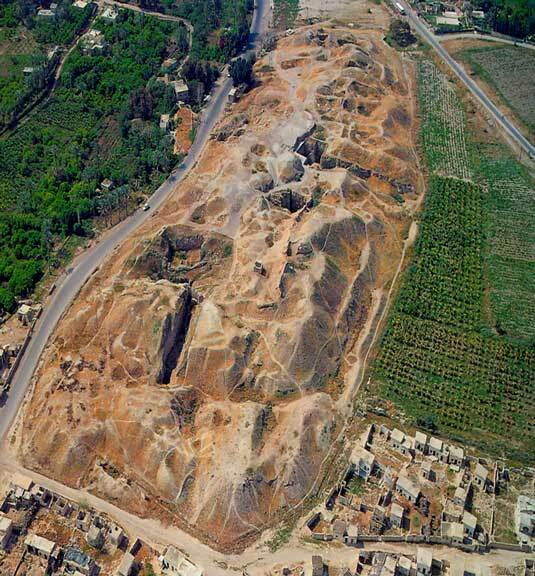 the site of Jericho, archaeology had proven, was enclosed by "definitive defensive ramparts". These fortifications comprised a stout wall 12-14 feet thick. He also stated that Jericho, at this time, was only about 8 acres in size, a very modestly sized city. He then moves into the second millennium BC. "About 1800 BC, a date depending ultimately on Egyptian chronology, the city of Jericho was re-fortified on a more ample scale. The area of Jericho now attained its maximum of about 12 acres..the defensive works of Jericho at this time were unparalleled comprising the three fold principal of glacis, parapet and outer fosse." Garstang used this evidence to indicate a period of relative prosperity. Jericho archaeology of this time produced art of the Hyksos, and from the period when Egypt was over run. Jericho archaeology produced names of Hyksos leaders on the seals of tombs. The palace area of the city suggests that some of these individuals lived and died in Jericho during this time. What Garstang stated next is very important. "The whole system was destroyed in 1600 BC by a general conflagration, an event which seemed to coincide with the demolition of the cities ramparts, though the evidence as to the date of the latter case is not so complete as to warrant a definite conclusion....Further extensive damage was done by a landslide, originating presumably in an earthquake which broke one of the main walls in two and brought the brickwork of this and other walls toppling down in large masses. This disaster was also accompanied by local fires which completely charred and cracked the brick and contents of the surviving rooms." Notice how the walls appear to have slid downward, reminiscent of a landslide. These walls formed a ramp, which allowed for the Israelites to march up and into the city. Jericho archaeology had perhaps produced evidence of the collapse of Jericho's walls. Garstang concluded that the tombs of the Hyksos were the most numerous and complete, and that Jericho was captured and the fortifications dismantled at the end of the Hyksos period, soon after 1600 BC. Ruins from the walls of Jericho. Garstang believed these to be the walls destroyed by the Israelites under Joshua. However, it was soon restored as a vassal of the Pharaohs, and continued in this state until the earthquake at the end of the 16th century. This ushered in the reconstruction of new buildings, and a new archaeological period, the Late Bronze Age. The conventional date for this period is around 1500 BC. "We come now to the last phase in the history of Bronze Age Jericho. The buildings of this period in the palace area and their contents are found to have been consumed by an intense conflagration which has left them embedded in a knee deep deposit of white ash covered by blackened debris.....The 15th century BC is represented by hundreds of intact specimens...notably one of Thuthmose III, the successor of Queen Hatshepsut in tomb 5 and two of Amenhotep III in tomb 4....the last names Pharaohs ruled from about 1411-1375." Garstang then points to the handful of specimens that represent the ensuing centuries, in sharp contrast with the vast amount of artifacts from the Hyksos, down to this Pharaohs reign. He concludes this is evidence that the city and its normal life "ceased utterly around 1400 BC". He wraps up his findings with the following. "We reach then the following conclusions; 1. The city perished while in active occupation 2. Buildings and their contents were consumed by fire of exceptionally intensity 3. The Ramparts fell at the same time as the adjacent houses and the state of their ruins points to earthquakes 4. The date of the fall of Jericho was about 1400 BC." In other words, it is quite likely that, according to Garstang, these ramparts collapsed as a result of an earthquake shock just before the onset of Joshua and the Israelites. Garstang also found dozens of jars full of grain dating from the last Canaanite city of Jericho. This evidence indicates these were from the time of the harvest, when the city was burned. Thus, the foremost archaeologist of his time had shown that the Biblical account of the conquest, and fall of Jericho, to be accurate with Jericho archaeology. It is important to keep in mind he mentions nothing of the other incidents surrounding Jericho in the Bible; such as Ehud and Eglon, the Levite, and subsequent burning of the Benjamite towns. Garstang's findings, though did not go unchallenged, stood on solid ground for about 20 years. However, Egyptologists were concerned about Garstang and his dates. They argued that if the Exodus took place during the 18th Dynasty, there should be evidence of building by the Israelites in the Delta region, of which there was none. Additionally, the date of the Exodus was still preferred to be in the 19th Dynasty, and Garstang's findings did not fit in with this view. His version of Jericho archaeology seemed to go against some commonly held Eyptian dates and events. John Bartlett gives an account of the most recent archaeological finds at the biblical site of Jericho in his book Jericho, Cities of the Biblical World, courtesy of barnesandnoble.com. Click on the link below to connect to Jericho! Israel-a-history-of.com hopes you enjoy the resources our advertisers supply! Your feedback on products, information, opinions, etc. are welcomed and encouraged! Just click on the Contact Us tab on the Nav Bar! In the 1950's Kenyon re-examined the site. She completely reassessed Garstang's findings. Jericho archaeology was to take on a new face. The double wall placed by Garstang in the Middle Bronze Age, around 1400 BC, Kenyon claimed it was from the Early Bronze Age, which she dated as ending around 2100 BC. This was a difference of over 700 years! She claimed no possibility that this wall could be connected to Joshua, and in fact, stated that Jericho had not been inhabited for at least 150 years before 1400 BC. 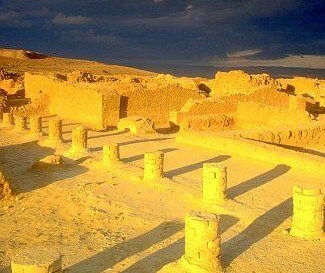 "that almost all traces of the Late Bronze Age town of the time of Joshua had been destroyed by erosion"
She agreed that the town had indeed been destroyed by fire and earthquake, but in 1580 BC, towards the end of the Middle Bronze Age II period. Kenyon stated that an acceptable end of the MBII period is the rise of the 18th Dynasty in Egypt, around 1567 BC, when Egypt drove back the Asiatics. Kenyon credited the Egyptians with the destruction of the walls which Garstang attributed to the Jews. Kenyon argued this destruction followed the Hyksos removal from Egypt, and subsequent ousting from Palestine. Critics of this view claim that Jericho is a strange location for an Egyptian invasion. The reason being the city does not rest on any main North-South route likely to be utilized by an invading Egyptian army. The following are excerpts from Kenyon's findings. "At Jericho, the evidence for destruction is even more dramatic. All the middle Bronze Age buildings were violently destroyed by fire....The stratigraphical evidence suggests in itself that there was a gap in the occupation at Jericho. This is confirmed by a gap in the occupation of tombs in the cemeteries. Burials cease in all the tombs in the northern cemetery at the end of the Middle Bronze Age (1550 BC - conventional dating)." The stratigraphy of Jericho provides evidence of an extensive settlement. Each layer represents an era of time. The bottom layer represents the oldest years of occupation, working upwards as each successive generation built upon the previous. Thus, Jericho archaeology attempts to bridge the physical findings and social / cultural events with dates, to the layering of civilization provided by excavation. Kenyon states that tombs were found in the Western cemetery dating around 1375-1300 BC. This is still before her date of the time of Joshua. "The evidence from the 1952-1958 excavations at Jericho indicate that there was a Late Bronze Age town there in the 14thcentury which might have been attacked by Joshua, but nothing survives to illustrate the Biblical account. It also suggests that if this destruction followed by 600 years of abandonment was the work of the Israelite tribes under Joshua, it is not likely to have been later than 1300 BC, which is difficult to reconcile with a flight from Egypt in 1260 BC." Kenyon, with this statement, concludes Jericho archaeology disproves the Biblical account of Jericho. She also finds no evidence of the occupation during Eglon's reign of the Moabites, as well as nothing from the time of Ahab. Ancient ruins from Jericho. These are some of the oldest yet discovered of ancient Jericho. "Newcomers who were presumably the authors of the destruction settled in considerable numbers in the area but they did not build for themselves a walled town..."
She also found another massive destruction of Jericho by fire at the end of the Middle Bronze age. After this, there remains limited evidence of occupation during the Late Bronze Age (1550-1200), and after that, nothing. The Biblical account, Garstang's finds, and Kenyon's conclusions do not seem to fit at all. It must be noted that the dates surrounding Jericho archaeology, for both Garstang and Kenyon, are solely based on Egyptian Chronology. This has since been proven to be erroneous, and a revised chronology has been set forth. Thus, taking only the words of Garstang and Kenyon, and by comparing these with the revised chronology, the following conclusion can be made. The findings of Jericho archaeology are taken into consideration, disregarding the controversy of conflicting dates. These findings are then applied to the revised Egyptian chronology. 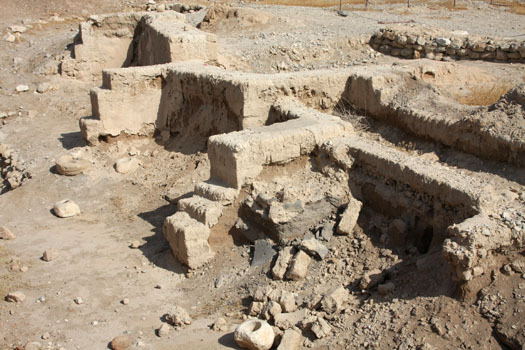 Jericho archaeology has produced two possibilities for the position of Joshua and the conquest of Jericho. One centers around the wall Garstang found. Kenyon claimed this wall was from the Early Bronze III period, placing it from 2700-2200 BC, far too early for Joshua. The other position centers on the wall Kenyon found from a later age. The problem with this wall is that nothing really came after it, and the Bible still talks of at least two other periods of occupation in Jericho. 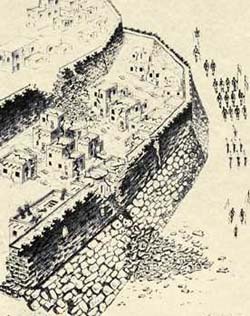 Garstang's wall shall be taken to be the wall during the time of Joshua, then Kenyon's second wall is the final remains of the walls of Jericho stemming from the gradual occupation of the tribes of Benjamin. From this gradual occupation, Eglon King of Moab over took these Benjamites and established The City of Palms as part of Moab. A reduced city seems to fit with findings from Jericho archaeology. This led to the story of Ehud, the left handed Benjamite, and his assassination of King Eglon. In turn, this led to the re-occupation of Jericho by the Benjamites. The towns of the Benjamites would eventually be burnt by the remaining tribes of Israel. This was in retaliation of the heinous crime committed by the Levite on his concubine. Parts of her body were sent to all the tribes of Israel. The artifacts from the Hyksos occupation is evidence of Jericho's occupation before the Exodus, and the appearance of the Israelites in Palestine. The tombs of the Egyptians signifies the Egyptian influence and presence living in the area after Hiel had rebuilt the city at the cost of his two sons. The loss of his two sons fulfilled the Lord's curse Joshua placed on Jericho. Jericho archaeology alone, would seem to fit the literary background evidence surrounding Jericho. These were the tombs of the Egyptians responsible for giving advice during the time of the Divided Kingdom, when the Northern Kingdom sought Egyptian help in fighting off the Moabite threat, and, of course, the power of the Southern Kingdom Judah. Jericho was a strategic city. Thus, the following is a description of Jericho, based on the conventional dating, Jericho archaeology, and explanations, in comparison with the revised dating and revised explanations. Revised Explanation - The time of Eglon & Ehud and the re-occupation by Benjamites. Final burning of Jericho. Revised Explanation - Thuthmose helps Deborah in her battle with Sisera, thus the Egyptian influence in Jericho. When the events of the Bible are viewed in context with Jericho archaeology, there is little question the Biblical account of Jericho is indeed an actual history of a city which dates back thousands of years, possibly as early as 9000 BC! The awesome ruins from King Herod's opulent and plush palace he built in Jericho, The City of Palms. The dates surrounding these events remain controversial at best. However, even archaeologists will admit the most controversial area of this amazing field of study is the actual dating of events. It should come as no surprise that dates vary widely, and should not be used as evidence to dismiss one particular theory over another. Regardless of dates, Jericho archaeology has left little doubt as to the city's antiquity. It is perhaps the oldest city on earth! The ancient city of Jericho rests within miles of modern day Jericho. The very same water supplies of modern day, supplied the residents of ancient Jericho as well. Life has perpetually existed in this region since man first appeared on earth. Despite the conflicting dates surrounding Jericho, it's impact on ancient Israel cannot be denied.